There’s no denying that feather flags and teardrop flags are a great way to advertise your business or event, but these shapes often get overlooked because they are so common. If you want the type of banner that prompts a second look from passers-by, choose a triangle banner flag from Australian Flag Makers. Our triangle banner flags offer a unique shape that really catches the eye, making them perfect for nearly any business, event, or tradeshow. They can easily be used both indoors and out because the design of this flag allows it to display your image or logo fully without the need for a breeze. Here at Australian Flag Makers, we make our flags to last so you can use them over and over again. We print in full colour on 200D polyester, so our flags can stand up to the elements. We use digital printing techniques, which allow us to recreate any logo or image in full color, and each flag is heat-set to ensure that it is completely waterproof. All the edges are double stitched to prevent fraying. There are many different ways you can display a triangle banner flag. The easiest, and most affordable, option is a single sided flag. This type of flag displays your logo or image in full color on one side, and in reverse on the opposite side as the image shines through the fabric. If you want your image to appear correctly on both sides of the flag, choose a double-sided flag. The construction on this type of flag is really like two flags in one. Two separate panels are created and sewn together with a blackout panel in between, ensuring your image shows up correctly on both sides of the flag. Setting up shop in a parking lot at your next event? Or maybe you want to set the triangle banner flag up outside your business? No matter what your needs, we’ve got you covered! 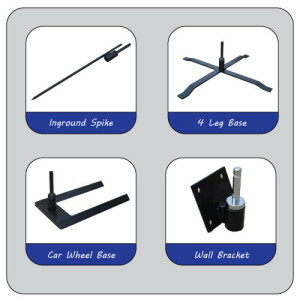 We offer multiple bases that are perfect for indoor and outdoor use. The best part is that our bases are interchangeable with all of our triangle banner flags, teardrop flags, and feather flags! 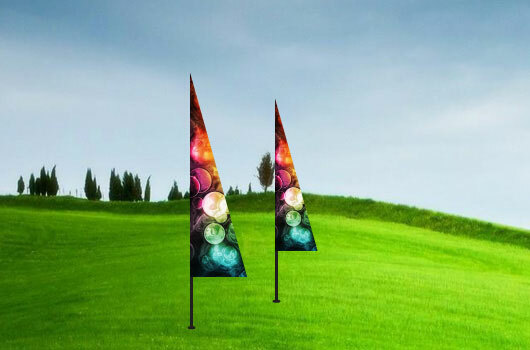 Create multiple flags for special events, sales, and more, and use the same base! Digital Printing Full Colour Print. Single sided or Double sided, what is the difference? If you’ve purchased a flag product from us in the past and don’t need a pole or a base, just let us know! We’re happy to customize your order! There are so many ways to customize your flags when you order from Australian Flag Makers! Not only can you choose the image, flag construction, and base, you can also choose from a wide variety of sizes! Choose from four standard sizes, or create a custom size for a special event. No matter what your needs, we can transform them into the perfect flag! Fill out our custom form and tell us a little more about your upcoming project. We’ll provide you with a free quote!